TheAngrySpark: Behold- Bruce Lee Mimobot! 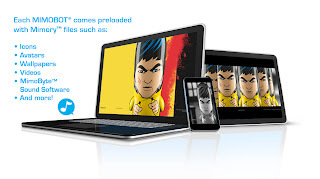 Yes, maybe the greatest (definitely the best known) martial artist of all time is now able to tote your data around for you courtesy of Mimobot and Bruce Lee Enterprises. "The Legends of MIMOBOT series is all about shining the spotlight on figures who have changed our world," says Scott Seraydarian, Director of Media at Mimoco. "Bruce Lee is more than just an athlete, an actor, or an ambassador. He's an icon, and we're thrilled to realize him in MIMO-form. It's a perfect match. Bruce Lee was known for his lightning fast speed, just like our MIMOBOT USB flash drives. Bruce Lee was known for crossing cultures and disciplines, just as MIMOBOT flash drives are the perfect synthesis of technology and design. Just make sure you shout 'Hiiiiiiiiiiiii Yahhhhh!" whenever you plug your Bruce Lee MIMOBOT into your computer!" This high kickin' little Mimo is available now on Mimoco.com Brucelee.com and at specialty stores everywhere.